What’s better than warming up with a hearty bowl of sweet potato soup? 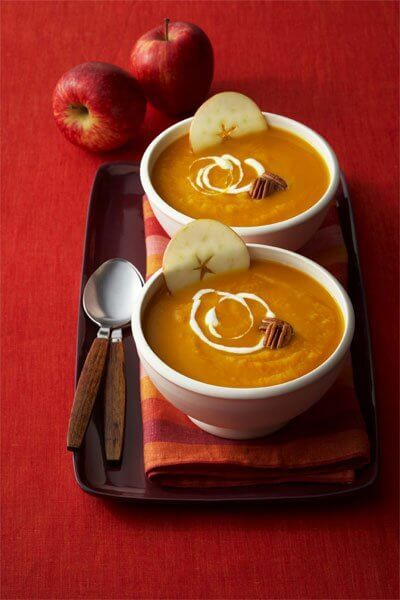 Perfect for a light lunch or dinner, our Curried Sweet Potato and Apple Soup is the perfect balance of sweet and savory. The spicy kick of curry powder and the creamy consistency are what make this sweet potato soup a Serve with brie and apple grilled cheese sandwiches, topping with homemade croutons, or sprinkling with herbs of your choice. Pierce sweet potatoes and apples with fork tines. Microwave sweet potatoes and apple on high until apple is very tender, about 6 to 7 minutes. Remove apple; set aside until cool enough to handle. Continue microwaving sweet potatoes on high until tender, about 4 to 5 minutes longer. Set aside until cool enough to handle. Meanwhile, in large saucepan over medium heat, heat oil. Add onion and curry powder. Cook and stir until onion begins to brown, about 5 minutes. Add broth. Bring to a boil, reduce heat to low; simmer 5 minutes. Transfer broth mixture to bowl of food processor; reserve saucepan. Halve sweet potatoes and apple. Remove apple core, scoop potato and apple pulp from skin. Add to processor. Add salt; whirl until very smooth, gradually adding apple juice through processor feed tube. Transfer mixture to reserved saucepan. Bring to boil over medium heat; whisk in yogurt. Reheat just until hot (do not boil). Serve topped with croutons, if desired.